It has been tough finding something to shoot lately. 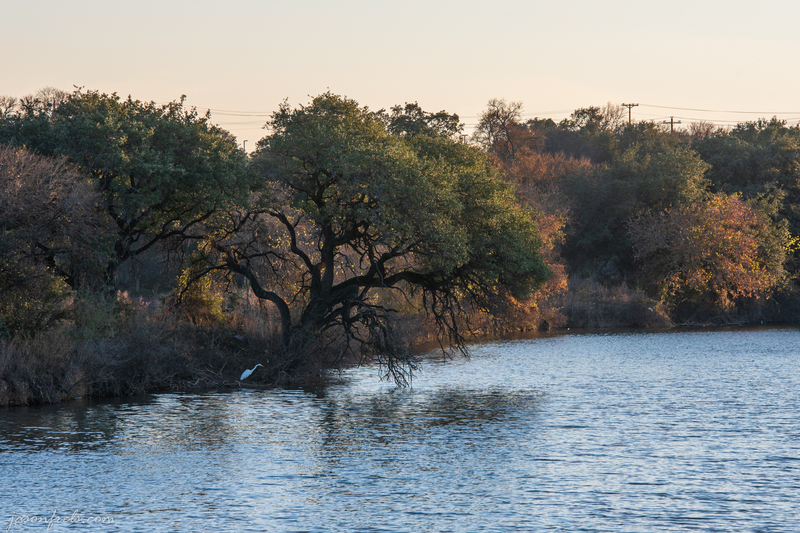 I decided to try Brushy Creek park as I often see a barren tree in the water with a lot of white birds perched in it as I am driving past on the bridge. I thought that this would make a nice photo in the late afternoon sun. The birds didn’t show up, so I wandered down the bank of the creek a bit and settled in a spot. I focused on a tree overhanging the creek with a bird in the water below. I put on my longest lens to try to get in close. The sky was very bright and a bit hazy, so I put on my filter kit with the grad filter to see how that would help. The photo below is shot with the grad filter. It turns out that it is a bit difficult to use a grad filter on a zoom lens. At 160mm, the transition area of the filter is zoomed in and not as easy to detect and line up on the screen. I decided to also take some brackets to make an HDR merge without the filter on. So, using the histogram, I took 5 pictures to merge later when I got home. Below is the resulting merged image using Lightroom. I did have a lot of issues with ghosting in the leaves and eventually had to set the ghosting to maximum to get a useable image. The HDR merge made the sky much more orange. I was able to get sufficient data with the filtered single exposure to make a decent image. With only a single image, there is less chance of ghosting blur between the images as well. It is a bit difficult to use the filter with a zoom lens, but with some experimentation I made it work. So, I think I like the filtered image a bit better. It wasn’t a very photographic day at the park, but I got to experiment a bit and perhaps learn a thing or two. Good for you … to experiment and compare. Ghosting can be a problem when it’s windy and blowing leaves and grass around. I manually blend exposures and one way to get around this is to process a single RAW frame light, medium and dark then blend whether manual or HDR software. I’ve occasionally used the single-RAW-file technique you mentioned, and not only for exposure. I’ve sometimes given more or less clarity, more or less noise control, to some parts of an image than others. Local adjustments are the ticket to creating superior results! My Photoshop skills are not near as good as my Lightroom skills. I generally mess around with putting graduated filters or brushes on the image in Lightroom if I think I need to. Lately, I have been experimenting with physical filters to accomplish this in camera. I will often do HDR but a little of this goes a long way. Thanks for your suggestions and input on this. Maybe I will see you around the area. I like to use this technique as well and I find that I can sometimes rescue photos by blending different exposures from just one RAW file. That has the advantage of letting you adjust just the thing you want in each RAW copy, I guess, instead of messing around with filters. 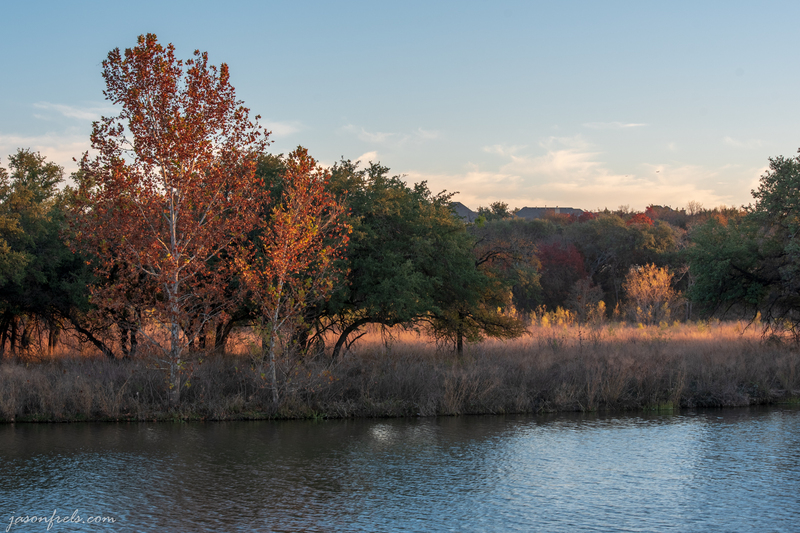 I usually end up photographing at Brushy Creek Park once a year or so. I like the place, but it can be crowded; I wouldn’t go on a weekend. The trail along the creek runs for several miles in both directions from the park, and I’ve sometimes walked parts of those sections as well. I was kind of starved for a place to go shooting and this place is on my way home, so I stopped. 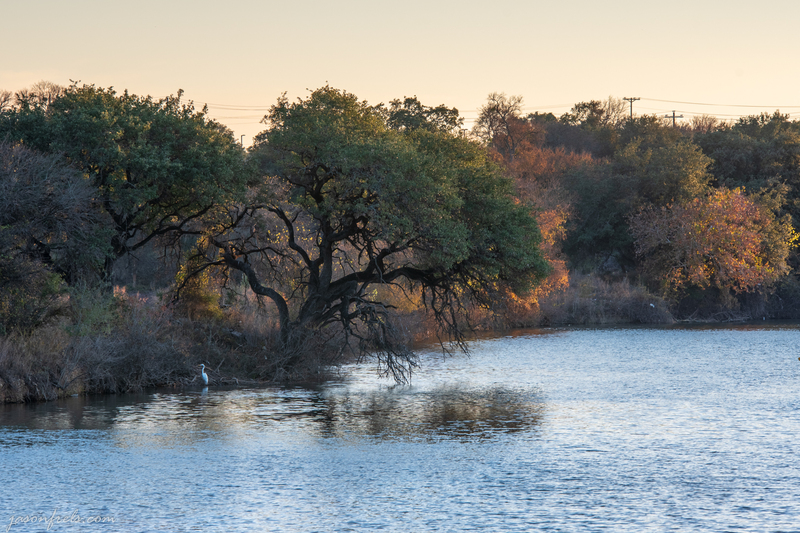 This afternoon, for the first time ever, we walked a section of the Brushy Creek Trail that runs east from A.W. Grimes Blvd. I got the impression that’s a relatively new part of the trail. Fortunately the wind hadn’t blown down all the colorful fall foliage.